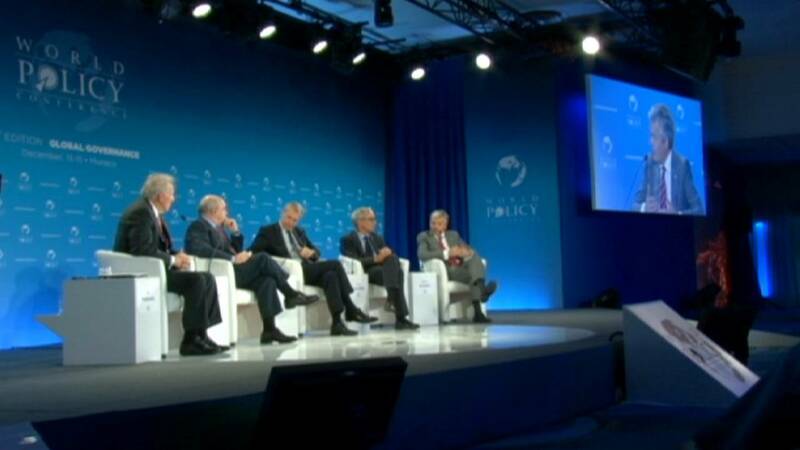 Montecarlo, in the Principality of Monaco, hosted the sixth edition of the World Policy Conference (WPC). Debates and workshops were centred around the main crises currently affecting the world. The conference was officially opened by Prince Albert II. On the first day attendees received the news that the Iranians had left negotiations on their nuclear programme, after the US decided to extend sanctions. Belgian Deputy Prime Minister Didier Reynders and Turkish Deputy PM Ali Babacan spoke to euronews about Iran’s departure. The Syrian crisis, as well as the decision by the US and UK to stop the supply of arms to the rebels, have been debated at the conference. Deputy Prime Minister Reynders gave euronews his view on arms supply to Syria. “I’ve never been in favour of supplying weapons, as long as we don’t have a very clear idea of who will use them,” he said. “There is much confusion today in Syria. We need to be very careful about the supply of weapons and support that we can give but, at the same time, do our best to bring all the partners to the table”. The European Union is also experiencing a geopolitical crisis, with Ukraine’s refusal to sign the association treaty and the huge demonstrations in Kyiv. Founder and President of the WPC, Thierry de Montbrial, believes an agreement is in sight. For Europe, the economic crisis has, first and foremost, caused a social emergency; with high unemployment in several countries, especially among young people. European Commissioner, Joaquín Almunia, talked us through a European strategy for employment. Cyber security and privacy protection is another huge issue, that for Europe could affect not only ethical matters but also its economic competitiveness. Swedish Foreign Minister, Carl Bildt, spoke of America’s impact on the issue. Euronews correspondent, Giovanni Magi, summed up the main points of the conference.